Recently retired after a 30 year civil engineering career, I write romance and mystery novels in Ottawa, Canada’s Capital. When screenwriter Marie Lilly wrote a screenplay based on my debut romantic suspense Diamond Hunter, I became fascinated with the process of turning a story into a movie. It takes an army of talented people – screenwriters, directors, producers, actors, stunt people, set decorators, camera operators, and many more. I wanted to explore how they create movie magic. I decided to set my new humorous contemporary romance series in beautiful Muskoka, Canada’s summer playground for the rich and famous. In each novel, novella or short story in the Hollywood in Muskoka series, someone in the Hollywood film industry unexpectedly falls in love with a local. Every movie has a soundtrack, so why not Caught on Camera? I had a wonderful time selecting songs for the book's playlist. Readers can assemble a playlist on a device or click on embedded links in the ebook that will take them to the songs on YouTube. Every book needs a dog character. 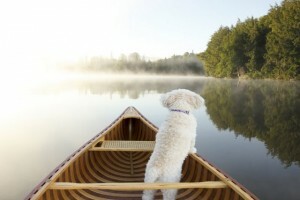 That’s Caught on Camera's Mopette in a canoe on Lake Muskoka in the pic above. Growing up, the family always included a dog and a cat. The cats ignored us, as cats do, but the dogs hung out with me and my three sisters during long hot summers at my grandparents’ cottage on Georgian Bay in beautiful, rugged Muskoka, Ontario, Canada. You’ll find a dog in all my books except Diamond Hunter. The female geologist who inspired Petra Paris, DH’s heroine, owned a dog with an expensive appetite. Read about it in my post The Dog Ate Her Diamond Earrings. New Adult, Romantic Comedy, Hot Contemporary Romance, Mystery … Which label applies? A connecting theme in my romances and romantic mysteries is that the heroine/hero is empowered to tackle any challenge, and, in the process heal the broken bits and discover who s/he really is. I love to hear from readers! Message me in an email or on Facebook. And if you are so kind as to write a review, please let me know so I can thank you personally.